A scrapbook of the things that inspire me. I'll be covering fashion, style, food, photography, interiors and interesting things happening on the street. Back in the depths of winter I wrote about rediscovering outerwear as statement pieces of clothing as opposed to just functional in A Coat Story. I can happily report that this shift has also been activated in my spring/summer wardrobe (my bank balance isn't as happy about this development!). This has opened up my eyes to a whole new array of outerwear possibilities; and means that your outerwear of choice is as considered and as much part of your outfit as the rest of it - not just an afterthought because you felt 'you had to take a coat or jacket'. 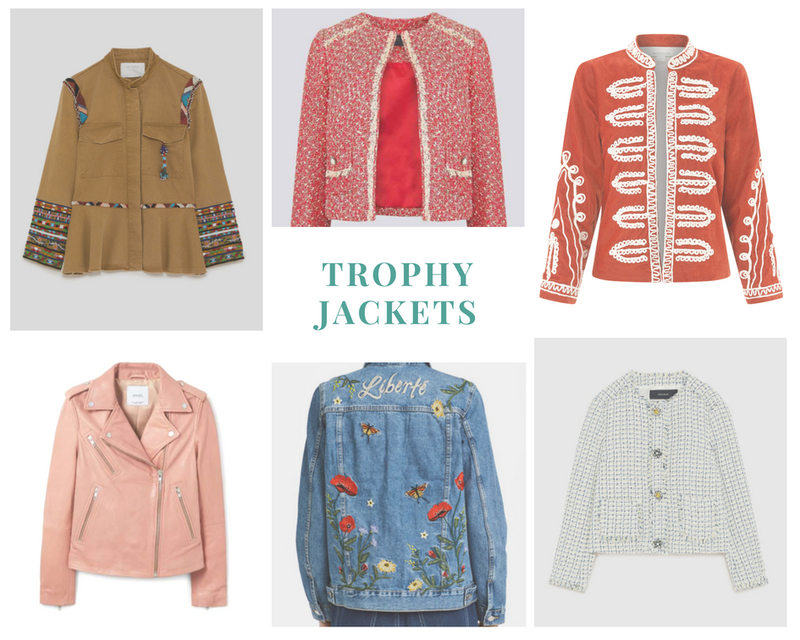 Introducing, the Trophy Jacket, which is by no means a new thing. 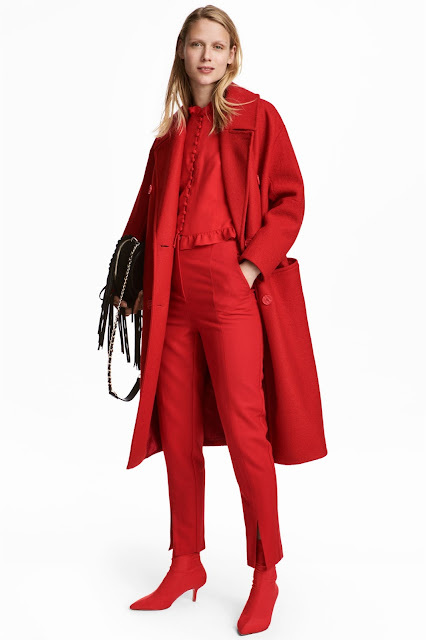 It's a term coined by former British Vogue fashion features director Harriet Quick, who defined them as 'real status pieces that are assuming the position once held by it bags. They transform outfits and can slick up anything from jeans to tube dresses. They vary in silhouette, but are all highly decorative and have big identities'. Very fitting for right now, given that there are myriad trophy jacket options are we enter into summer. Choose from embellished shackets, blazers, bikers, trench coats, Chanel-inspired bouclé and tweed numbers, safari jackets and so many more. I've had a little look and rounded up my favourite trophy jackets, available right now. I think they're all classic styles that won't date, and can all be slipped on to zjuzj up everything from a white tee, jeans and slingbacks and a camisole and chinos to shoulder-robed over a midi dress or paired with a pencil skirt. 1. Embroidered safari jacket, £69.99, Zara | I have this stunning embellished safari jacket - it has such beautiful details and looks equally good over jeans as it does over a dress! 2. Printed open front jacket, £69.00, M&S | Love this Chanel-esque open jacket in a beautiful red! 3. Melissa military jacket, £89.00, Monsoon | Love this military style jacket in this rusty terracotta shade. 4. Leather biker jacket, £119.99, Mango | A perennial style staple, this leather biker is this beautiful pastel pink is definitely a summer trophy jacket! 5. Embroidered denim jacket, £39.99, H&M | I've chosen to show off the gorgeous back of this embroidered denim jacket - denim jackets are back in a big way (did they ever go away?!) 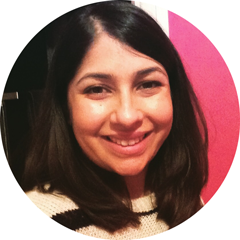 and I'll be rounding my favourites up in a post soon! 6. 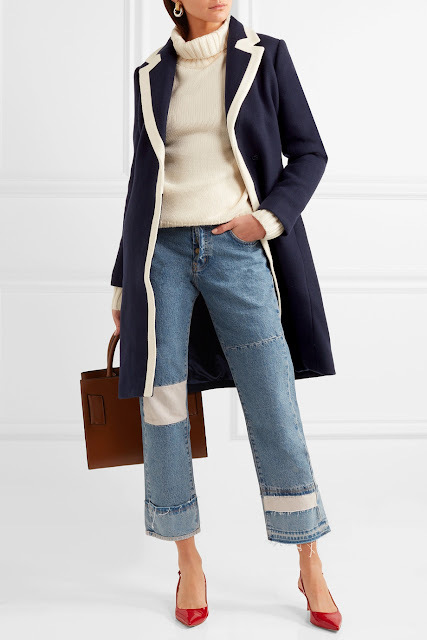 Tweed blazer with gem buttons, £69.99, Zara | Love this gently-Chanel-esque tweed blazer in a cool hue, adore the gem buttons. This jacket is perfect for summer! What are your thoughts on the trophy jacket? Which one is your favourite? Just the other day I was chuckling about the fact that fashion is so cyclical. Literally everything comes back round! Case in point, earrings... Just a two or three years ago we were all rocking gigantic sparkly, gem encrusted chandelier earrings, in every metallic finish available. Briefly, the attention moved onto ear cuffs, and stacking rings, and then multiple ear piercings. Last summer we saw tassels and pom-poms dominate the earring (and accessory) arena, and this fleeting trend transitioned us into autumn/winter, with the arrival of festive tassels and pom-poms in hues such as oxblood, forest green, gold and silver. Now, for spring, proper statement-making earrings are firmly back and it seems, here to stay for good. There are myriad options to choose from; sculptural and architectural creations, baubles, tassels and pom-poms, pearls, precious stones, minimal (and maximal) studs and hoops, mismatched, and even single earrings, from purse-friendly pocket money options to more luxe, premium options from independent labels and of course designers. 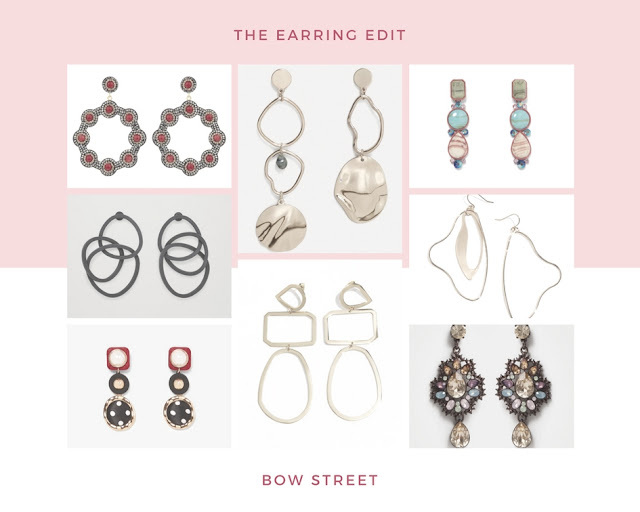 What I love about earrings is their transformative abilities - they can help you switch up your outfit from work to play, day to night in an instant. Throwing on a pair of statement earrings is a low-commitment way to trial a trend, and the right pair of earrings can make or break an outfit. Why not let your earrings do the talking - let them shine through by wearing your hair tied back, minimal make-up, a simple outfit and the boldest earrings you can find! LET ME KNOW WHICH ONES ARE YOUR FAVES! Like me or loathe me, but I don't really like the novelty, gaudy Christmas wrapping paper that seems to be everywhere... I have always had a thing for brown / kraft paper, so that with an assortment of adornments is usually my wrapping theme of choice. 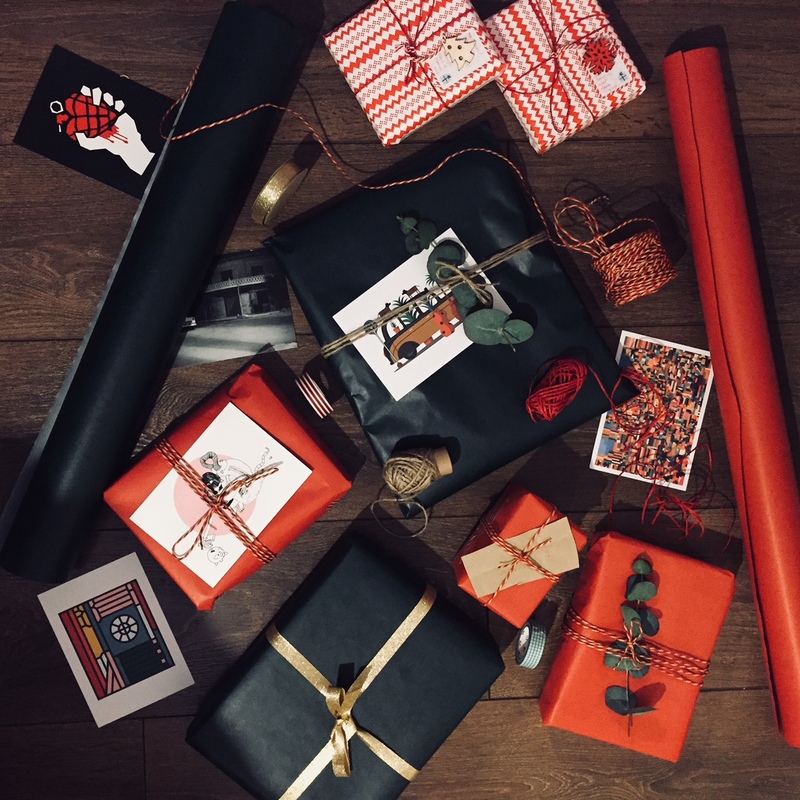 I just spent last night wrapping a pile of presents so thought I'd share this year's wrapping look and feel, as I have stayed with the kraft paper / brown paper category, but have dipped my toe into the colour territory, and also gone for one print. I do like to put a lot of effort into choosing my favourite wrapping papers, tapes and adornments, but whilst I want to to look festive, I don't want the presents to scream Christmas, AND I want the option to be able to use the paper all year around. 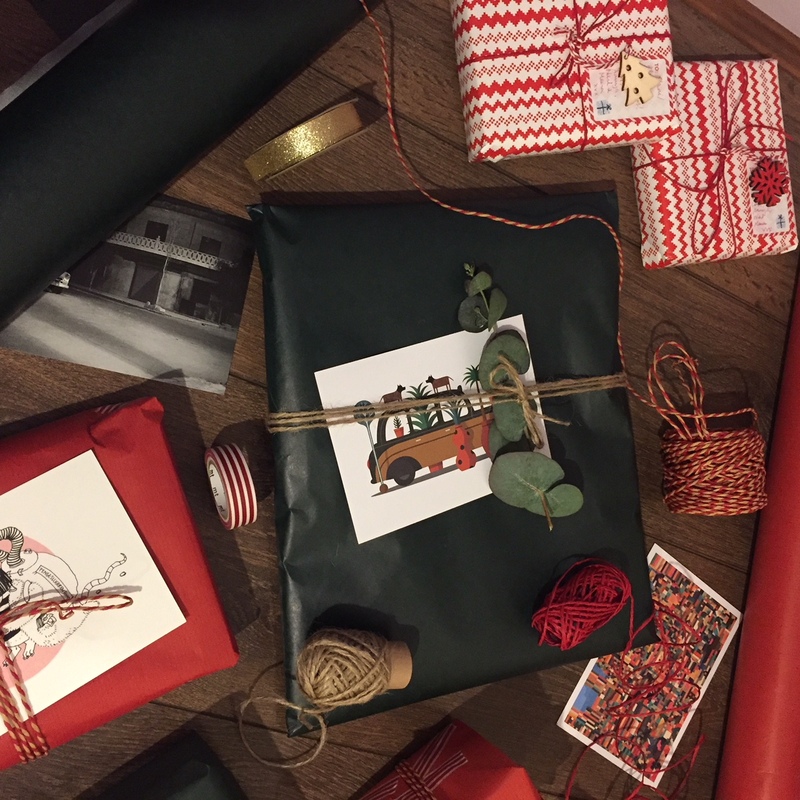 So the anointed choices this year are red kraft paper, a sumptuous dark green thick paper and a red and white geometric print, coupled with an assortment of twines, ribbons and adornments. I have also purchased a few rolls of brown paper, and brown paper with subtly festive prints. Throughout the year I like to collect postcards, little illustrations, twine, string, ribbon and washi tape for my adornments. This year I've also picked up a bunch of fresh eucalyptus leaves for a touch of greenery. I like to make gift tags with paper luggage tags or use postcards or stickers! There are so many places that have free postcards with beautiful photography or illustrations on them, I just collect them as I go and save to use on presents. 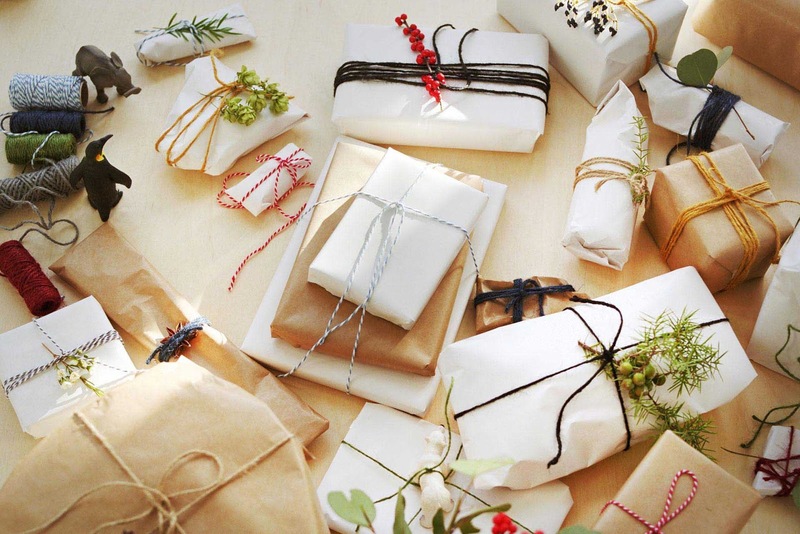 You can also use music scores, old maps or magazine imagery stuck onto card one on side, tied with twine, for a unique gift tag. What are your favourite ways to wrap Christmas presents? 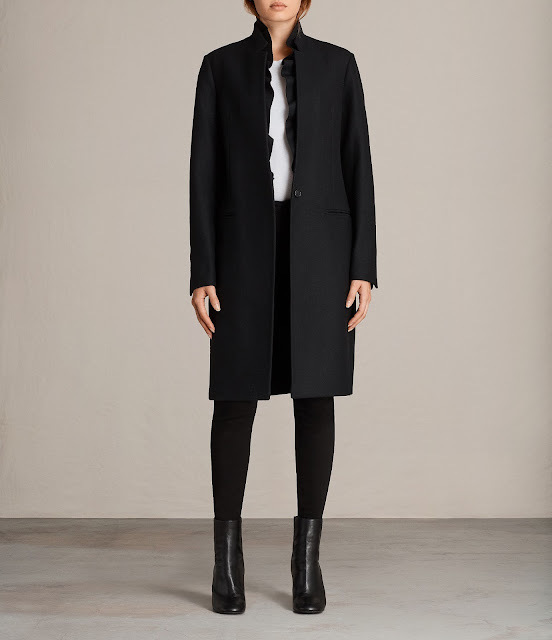 Even though I have always loved fashion, when it came to coats, I saw them more as a functional clothing item to keep me warm. From a young age I'd have one winter coat a year, often in a boring, neutral colour, without any real thought given to choosing one I truly loved. Even in recent years, this way of thinking has continued with the mentality that I ought to get a practical, warm winter coat, often picking classic styles without much care or attention. 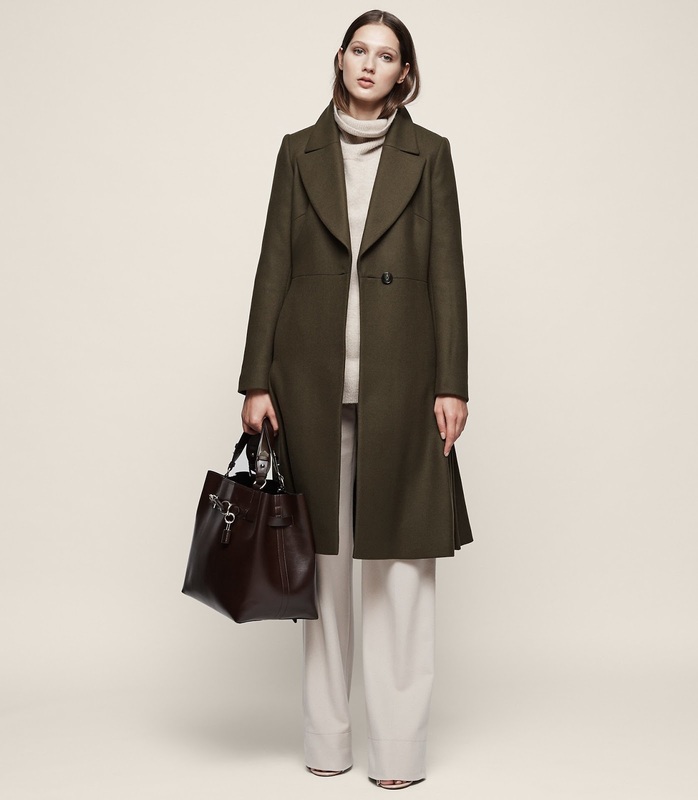 It's only this Autumn when coats began to take centre-stage. 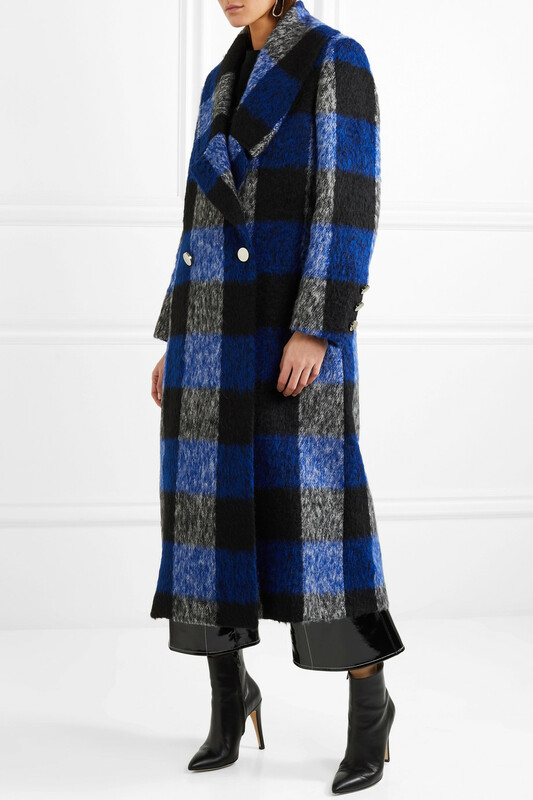 Maybe I have been living under a large rock, but it seems that suddenly there are a kaleidoscope of coat options everywhere! From myriad faux fur options in multiple lengths and hues, to checked and houndstooth, to ruffled, bouclé, embellished and everything in between in every rainbow hue imaginable. They are all warm and functional but simultaneously statement-making, and I'm finding that many friends and colleagues have a few 'coat options' in their wardrobes, not just the one winter coat. 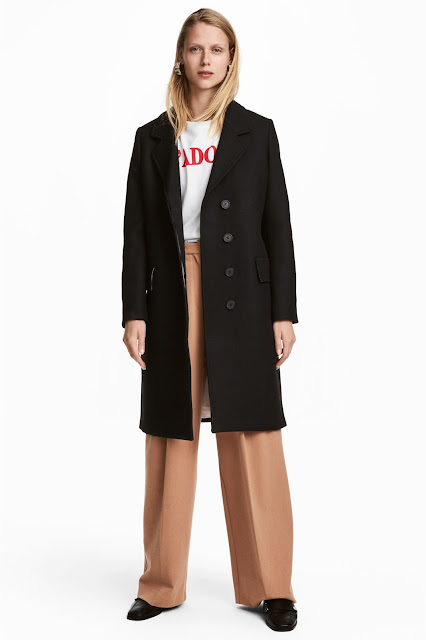 Naturally this has meant that I am more attracted to coats than ever before, trying out styles, prints and colours both in and out of my comfort zone. Both the high street and designers are teeming with bold and chic coat options right now. 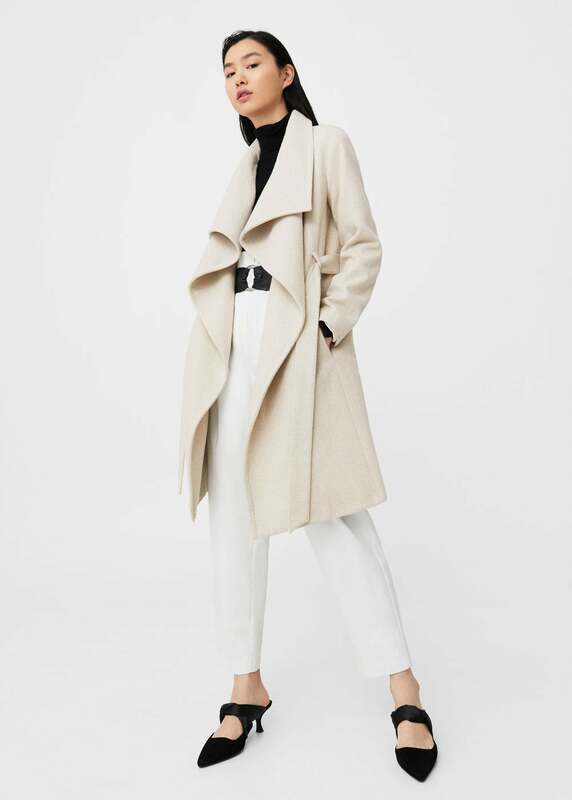 I've admired some seriously chic coats from MSGM and Maxmara, but equally at Reiss, Whistles and Jigsaw. 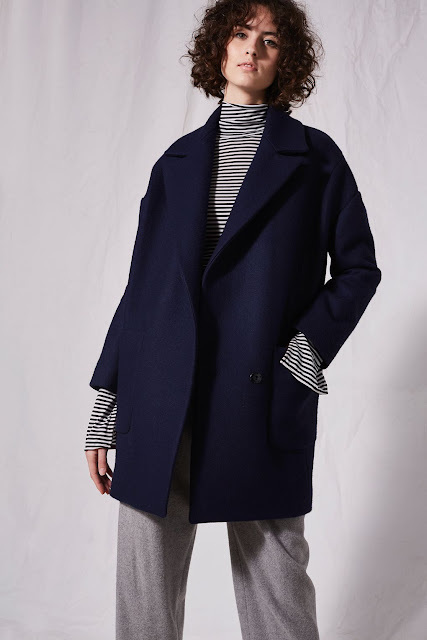 Whilst on the hunt, I've been really fastidious at looking at the material composition of the coats, and shockingly, many of them were high in polyester and acrylic and very low in actual wool content, despite their hefty price tags. 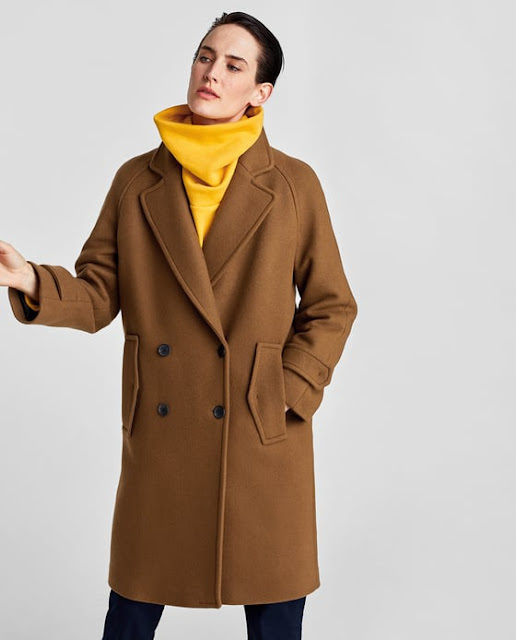 A couple months ago, scrolling Instagram one day, I spied a gorgeous coat - a strong contender for the coat, originally in camel. 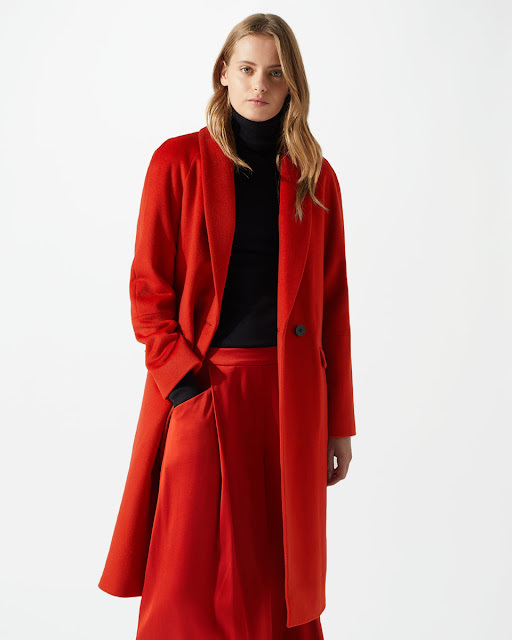 It was a beautifully cut, slightly oversized, 100% wool number by Jigsaw, and I saw that it also came in a burst orange colour, officially named 'Nordic Orange' by them. From that moment I visited it in store, tried in on a few times and decided it was to be mine. Black Friday and Cyber Monday came and went without an enticing offer from the retailer, and either way I had to wait till the end of the month to save up for the coat. So when I asked about upcoming promotions, one of the sales assistants was kind enough to let me know that one was coming up... That weekend, with bated breath, stealth and my wallet in tow, I tracked down the promo code and made my order! On arrival, it was everything and more, I love it and it's seriously warm! At this price point, with 100% wool, I think it's fantastic value for money. However just because I've found this coat, doesn't mean the hunt has to cease...I'm still looking for other 'coat options' to take my fancy. I've had a little look and selected my little edit of other coat favourites below. I truly believe they are all investment options, in classic styles that won't date. I've also picked coats with at least 50% wool content. Which one is your favourite coat? It's December now, which means we can officially be festive! All around London there have been preparations for weeks, adorning streets with the prettiest lights and decorations and shops have been pumping festive tunes out of their speakers for a couple weeks now, whilst shoppers begin (or complete, if you're a smug early bird) their Christmas shopping. 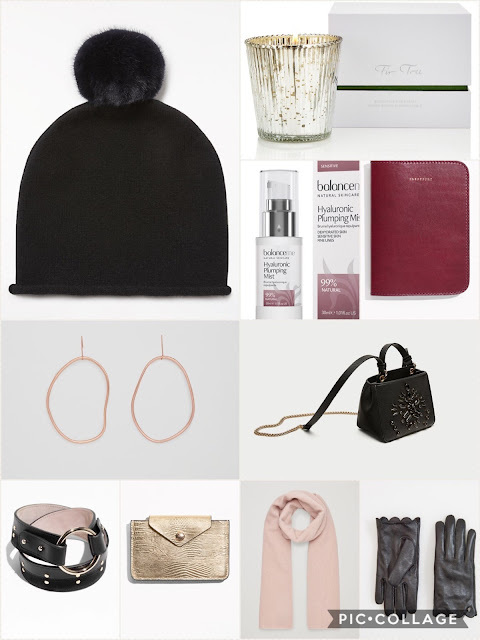 JL Cashmere Bobble Beanie Hat, £45, John Lewis | After years of frittering away hard earned cash on man-made fibres, like acrylic, this winter I treated myself to this ultra soft cashmere beanie, complete with cute bobble. It keeps me so warm and cosy! Available in a few neutral colourways, this would be a lovely gift to give! Balance Me Hyaluronic Plumping Mist, £12, John Lewis | I love a face mist, and recently purchased this one. It's packed full of natural ingredients like chamomile to soothe, but a good dose of (my favorite ingredient) hyaluronic acid, keeps skin hydrated - handy with the mix of central heating and changing weather conditions our complexions have to endure. Leather Passport Holder, £29, & Other Stories | This Parisian designed, seriously chic passport case in burgundy, instantly conjures up vintage travel adventures. Just imagine the gift of memories you will help create with this magical passport case! Abstract Pendant Earrings, £17, COS | Let's take a break from tassels and admire these brass beauties, I certainly have been! They are ultra pared back and simple, yet impactful all at the same time. Perfect when paired with a black polo neck, or anything! Beaded Crossbody Bag, £19.99, Zara | There's something about this little black beaded bag - it's sleek and embellished so works perfectly as an evening bag (especially for the festive season), but would work equally as well as a crossbody for daytime essentials too - double whammy! Studded Waist Belt, £45, & Other Stories | Add some definition to the waist, with this chic studded leather belt. It's an outfit transformer and can be worn cinched over coats, knits and dresses to create some shape. Leather Card Holder, £35, & Other Stories | I recently downsized my huge wallet to a small cardholder, and this one is my favourite. In mock-croc gold leather, with concertina style pockets - it's small but mighty and holds a lot! It's really chic and doesn't weigh me down! I would love to receive this as a gift! © Bow Street. All rights reserved.